Using 50 illustrations, the Performance Driving Illustrated eBook is the perfect reference guide you can use over and over again. It’s ideal for any performance driver, no matter what your experience level - whether driving on the road or track. And you can download this reference today, free of charge. 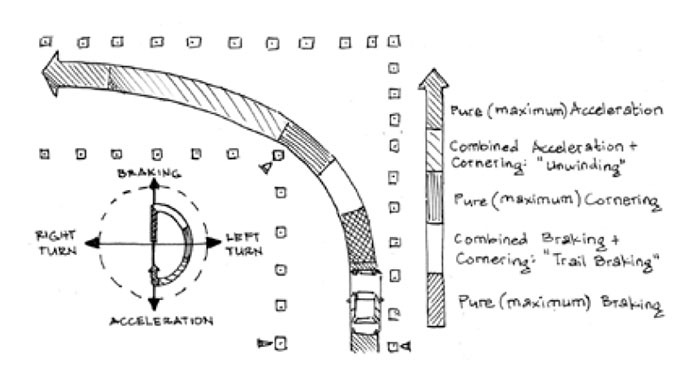 Over the years, I've used many illustrations to get my point across when teaching performance driving. These illustrations have mostly been on the white boards I've used in classrooms, but I've also created them for my Speed Secrets books. Recently, I've taken to using my iPad to quickly sketch them out for a driver I'm coaching. And many times I've wished that I'd saved these quick sketches because, for many drivers, a picture is worth a thousand words. This eBook is a collection of these illustrations. Some stand on their own and don’t require much explanation. Other illustrations need a little more context, so I've written some words to accompany them (but less than a thousand per picture!). If you want more detailed explanation of an illustration, well, you’re going to need to check out my Ultimate Speed Secrets book. By no means is this an absolute complete compilation of every bit of information that you need to drive quickly, consistently, and safely around race tracks. If you want more, you’ll need to go elsewhere (obviously, I recommend my Ultimate Speed Secrets book, my Speed Secrets Weekly e-newsletter, and especially my eCourses). What is included here are the illustrations and information that I’ve found myself going back to over and over again through the years. There must be a reason for that – it’s because this is the most important stuff. My hope is that these illustrations will trigger thought and provide some extra clarity around a driving technique or concept. Ultimately, they're meant to provide you with more understanding, and be a refresher or reminder of key concepts and information. Click here to download the Performance Driving Illustrated e-book.